Read more about our recent film shoot promoting our Dreamwave DJ Services provided in Essex, Suffolk and surrounding areas for weddings as well as both personal and corporate parties. Our team of Dreamwave DJ’s and crew all had a bit of fun in the warehouse a short while ago. We prepared for our new, behind the scenes promotional film. Laughter and friendly banter was prolific whilst on the road to creating our visionary masterpiece. Even I had the opportunity to show my budding DJ skills and gave a cracking performance on the decks; but I think I will be sticking to my desk job for at least the near future! Spike Grimsey was on form with his exceptional camera techniques to generate artistic snapshots of the guys performing and prepping equipment. These reflect the great place that Dreamwave Events is to work which truly echoes in the guy’s performances during our Evening DJ Service. If you are looking for experienced DJ’s that emanate confidence and fun whilst maintaining competent professionalism for your Evening Party; these are your guys! Our team of Dreamwave DJ’s: Paul, Dave, Spike, Martin, George and Darren are all accomplished performers that bring the party! Our Evening Service offers their experience as well as a choice of set up options with different style booths and lighting colour to match the theme of your party. Dreamwave DJ’s do not only offer DJ Services for the evening. My personal favourite is our Cocktail DJ Service, offering a tasteful alternative for an afternoon drinks reception. Our DJ’s adjust their performance to mirror the relaxed atmosphere. This is accompanied by a small discreet set up with appropriate music played. For further details of our DJ services, please contact us and we’ll be happy to answer any questions. Sunday 4th October 2009 at Charter Hall in Colchester is the Colchester Gazette Wedding Fair. You can find us on stand number 7 exhibiting our wedding DJ & Disco services. The fair is open between 10.00am and 4.00pm and is packed with over 50 exhibiter and 4 fashion shows. We look forward to chatting with you. Summer 2009 is proving to be very busy for us, i must stop and take a breather to telling you all about a fantastic 21st birthday where we provided a lot more that our DJ services…. You will see from the pictures below our clients had arranged a 21st birthday celebration with an awards theme. 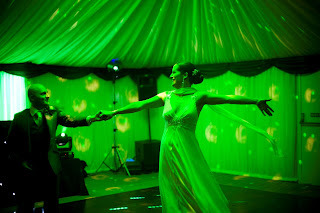 This took place in a private marquee provided by Exclusive Marquees. As well providing our Ultimate DJ & Disco Service our DJ Martin Cooper also took audio and visual control of the awards presentation, where we had proving and projection screen, projector, spot light and awards lectern. Our stylish and unique sound and lighting equipment really did fit to setting well. The party was still in full swing when myself and Paul arrived (after also DJing that night at separate weddings our self’s). The whole evening was a great success and our clients we very pleased with our professional service and high stands provided. It was also a great pleasure to work alongside our good friends Craig and Kate Williams Photography at this event. Thursday 23rd July was the wedding of the new Mr & Mrs Indge. We provided our complete wedding DJ & disco service at the amazing Layer Marney Tower, Colchester. The evening party worked well with us performing alongside the band and all the guests enjoyed the mix of music played. I would like to wish the new Mr & Mrs Indge all the best for the future as husband and wife. 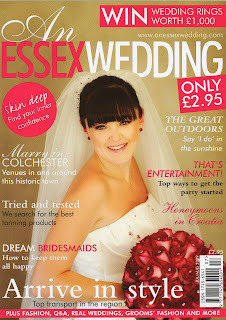 Make sure you get your hands on the latest issue of An Essex Wedding Magazine. 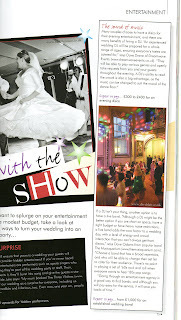 You will find some expert advise from us on how to chose your wedding DJ in there ‘That’s Entertainment’ feature. This latest issue also includes some amazing photos from our good friends at Craig Williams Photography in the ‘Getting Creative’ feature. We were delighted to be asked to provide our DJ & disco services for a ‘Spring into Summer’ barbecue at Le Talbooth in their stunning marquee on Saturday 13th June. A fantastic evening’s food and dancing was enjoyed by all. Our stylish and contemporary sound and lighting equipment is always much admired by clients and those from the Milsolms Group. On Saturday 18th April we were proud to provided our complete wedding DJ & disco service in a private marquee in Coggeshall. 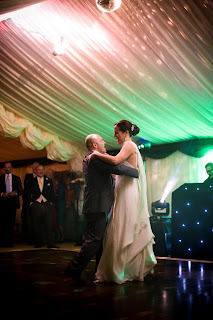 Our clients, the new Mr & Mrs Mozzicarelli requested a selection of modern Italian music as well as classic swing to be played throughout their drinks reception. 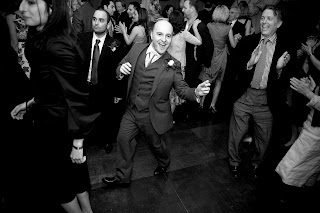 The complete day and evening party music was highly prised by our clients and all the guest attending this special day. To quote from the testimonial received ‘Judging by how full the dance-floor was, we were not the only ones who the loved the music. It was fantastic! You got the party going with a bang and kept the atmosphere up all night’. The stunning marquee was provided by Chelmer Marquees. The amazing pictures below were taken by Roger Brown their wedding photographer. It was a pleasure to work with these professional company’s on the day. I would like to wish the new Mr. & Mrs. Mozzicarelli all the best for the future as husband and wife! A move in the right direction…. We are proud to announce that Dreamwave Events have now moved into business premises in north Essex, near Colchester. Dedicated offices, and large warehouse space means an even more enhanced professional and reliable service. Among these facility we are also able to meet potential and existing clients to discuses there requirements in detail.